Published: Oct. 30, 2016 at 10:20 p.m. Updated: Oct. 31, 2016 at 06:19 p.m. Opportunity is the name of the game in fantasy football. Talent matters, of course, but we want players who see a healthy volume of targets and touches to anchor our lineups, especially in daily fantasy. Every week in the second season of the Opportunity Report, we'll look at all the passing targets for every NFL team and the percentage each player owns. Franchise will handle the backfield touches section this year and his Week 8 piece is tabbed above. With Michael Floyd and John Brown both coming into this game while spending time on the injury report, J.J. Nelson filled in as the No. 2 wide receiver. Nelson played on a team-high 91 percent of the snaps and did damage in all areas of the field. John Brown played over Floyd (54 to 42 percent of the snaps) and still looked like a preferred option for Carson Palmer. Larry Fitzgerald has averaged under nine yards per catch in each of the team's last three games and has not found the end zone. This is a reminder of the capped ceiling he has when multiple big-play receivers and David Johnson are all fully integrated into the offense. Julio Jones did appear to injure his ankle early in the first half and missed a few snaps thereafter. That might help explain his quiet day, as he came into Week 8 rocking 313 yards in the last two contests. However, this was the third game this season where Jones accumulated fewer than 30 yards and the fourth where he saw seven or fewer targets. We've talked about that in this space all year; these games are in the cards for Jones in 2016 with the deeper array of weapons the Falcons boast in 2016 compared to last year. Both Justin Hunter and Walt Powell played on more snaps than Robert Woods. Still clearly their best receiver, Woods has a solid floor in this offense while Sammy Watkins is out. However, it appears Woods, who has been on the injury report the last few weeks, might not yet be fully healthy himself. With Carolina largely in control of this contest, none of the pass-catchers needed to do much. Kelvin Benjamin racked up 50 of his yards on one long run after the catch in the early going of the first quarter. The game script took the air out of both Benjamin's and more surprisingly Greg Olsen's outlook on the day. There are no ground-breaking revelations to uncover here. The combination of A.J. Green and Tyler Eifert absorbed a whopping 71.5 percent of the Bengals passing targets in London. The only other player to see any meaningful volume was rookie Tyler Boyd, who played 83 percent of the snaps as the third receiver. Boyd checked in with an average depth of target under seven yards. A.J. Green was covered by Josh Norman on 27 pass plays and racked up five receptions for 76 yards on 12 targets, per Next Gen Stats. Green snared the rest of his production against Quinton Dunbar and Kendall Fuller, and took 25 percent of his snaps in the slot to avoid Norman. Darrelle Revis covered Terrelle Pryor on 49 pass plays, and the converted quarterback stung him for six catches and 101 yards on 13 targets. Pryor did most of his damage in the first half but this was just another reminder of how far along he has come in his transformation. Josh McCown being back under center brought some life back to Duke Johnson's stock. His 87 receiving yards were a season-high. Gary Barnidge, on the other hand, didn't follow up on the trend of his production sharply increasing when paired with McCown. The volume is just too spread out, with eight players garnering more than one target. Prescott was a bit off the mark early, but made big plays when it mattered most. His 10-plus average air yards per completion led all starting quarterbacks in Week 8. This sort of approach was made possible by the return of Dez Bryant in spectacular fashion. Bryant led the wide receivers with an 88 percent snap share and completely dominated the target share. Dallas built up a solid "death by 1,000 paper cuts" style of offense while he was out with an injury, but it's clear Bryant's presence will now be used to take the unit over the top. Bryant led all receivers in with Week 8 with 24.1 average air yards per reception. No changes to the Broncos passing distribution. 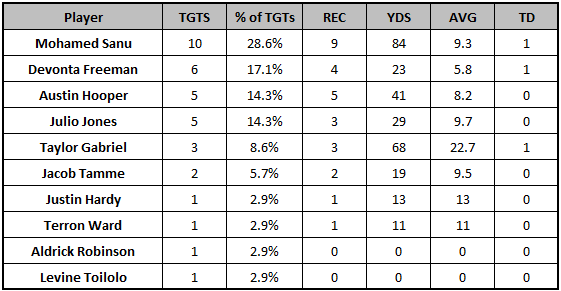 As usual, it was highly concentrated between the top-two wide receivers, with Virgil Green sprinkled in with under eight targets. Devontae Booker made good on the hope that he would secure and hold a passing game role with C.J. Anderson out of the mix. If Booker can maintain something around a five-catch floor, he'll be one of the safer running backs around. It was a bit of a surprise to see Eric Ebron and Theo Riddick return off multi-week absences to handle more targets than both Marvin Jones and Golden Tate. With the Lions emphasis on getting the ball out of Matthew Stafford's hands quickly, Riddick will always be a favorite target here. It appears that the target distribution will not be as a highly concentrated as it was for Jones to begin the season, or as it was for Tate while Riddick and Ebron were out. With Ty Montgomery and Randall Cobb out, the Packers were forced to play several of their younger depth receivers. That still didn't change the new quick-strike approach of the Packers offense. Aaron Rodgers averaged 6.26 air yards on his completions, which ranked 18th among starting quarterbacks heading into Monday night. Davante Adams even briefly stepped into the role of a running back/wide receiver hybrid that Montgomery was thriving in, taking a season-high six snaps from the backfield and hauling in all four of his targets for 33 yards. Cobb's absence also brought about a change for Jordy Nelson. The Packers deployed Nelson in the slot on a season-high 63 percent of his snaps. Nelson hauled in his longest catch of the season, a 58-yarder, from the slot. We still need more evidence that Nelson can beat outside man coverage with regularity like he once did, because that is where he will play predominantly once Cobb returns. If Cobb sits out another week, Jeff Janis might make for a fine desperation dart throw against the Colts in a likely Week 9 shootout. Keep those candles lit, Janis truthers. Houston largely took the air out of the ball with Brock Osweiler once again struggling to control the offense. They assigned 28 carries to the combination of Alfred Blue and Lamar Miller and their quarterback only threw the ball 29 times. That game plan kept DeAndre Hopkins in check, once again. Will Fuller left the game with an injury and only ended up playing 70 percent of the team snaps. Donte Moncrief returned from injury and filled a much needed role on the offense in his first game back. The big receiver handled a team-high nine targets and played the most snaps (89 percent) among the position group. T.Y. Hilton did get injured this game, but it was painfully clear while he was out how bad the team needed Moncrief back. Phillip Dorsett was targeted in the short areas (6.6 average depth of target), while Hilton functioned as a deep threat (20 average depth of target). All the while, it was Moncrief and his 10.6 average depth of target that was the complete threat among the group. Expect him to only handle more work going forward. Almost all of the yardage here was hollow, as Blake Bortles struggled with authority in the first three quarters of this game. The Jaguars fired their offensive coordinator on Saturday as a result of this game, and the utter regression of their starting quarterback. It's unlikely that Nathaniel Hackett can revive what was one of the most productive offenses during the 2015 season, unless he's able to fix Blake Bortles' mechanical issues on the fly. The volume is there for players like Allen Robinson and Allen Hurns, but without improved play under center their ceilings are greatly diminished. 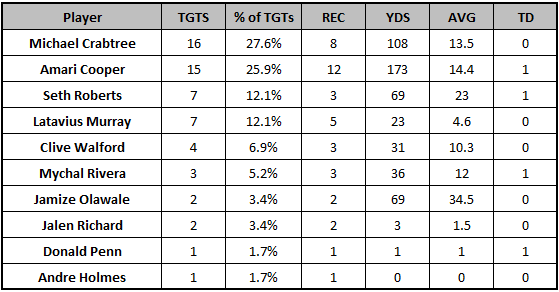 Both Travis Kelce and Jeremy Maclin progressed their numbers back to more traditional expectations. They both saw 10 targets after volume was a growing concern over the last few weeks. Tyreek Hill played on just 30 percent of the team snaps and his 21 total snaps were a season-high. The miniscule playing time is concerning, but at the same time, he has added his fourth receiving touchdown of the season and it is clear that the team wants to get him the ball when he's on the field. Not only does Hill take some of the high-concentration of targets appeal off of Kelce and Maclin, he now has appeal as an upside dart throw during the bye weeks. New England worked Julian Edelman downfield more than they had early in the season. His 11.1 average depth of target was a season-high, by far, but he caught just half of his looks. If you can sell him based off his one touchdown, feel free to do so. Chris Hogan had his revenge on the Bills by hauling in all four of his targets for 91 yards and a score. Tom Brady targeted Hogan at an average of 17.8 yards down the field, so he maintained his role as the deep threat. Hogan has a high ceiling in this offense, but his volume and subsequent production will be maddening to predict. With the emergence of Michael Thomas, Willie Snead's number of downfield targets has decreased of late. Thomas led the team in wide receiver snaps (79 percent) and had more receiving yards than any other player on the team. 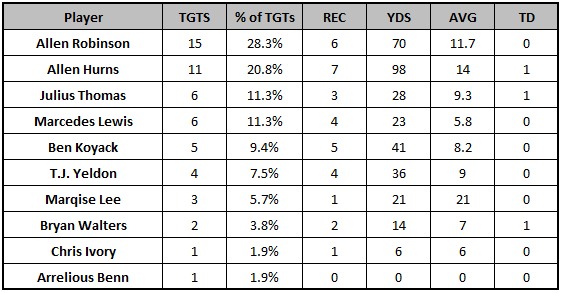 Strangely enough, Brandin Cooks played just 48 percent of the snaps and there was no reported injury. Perhaps the Saints just didn't want Cooks out there much as a run blocker. The team put 26 rushing attempts on Tim Hightower's plate after benching Mark Ingram for a fumble. Cooks was only on the field for eight run plays total over the course of the game. Coby Fleener was on a near even split with Josh Hill in terms of snaps percentage, but took a major backseat in this contest. Hill played 81 percent of the snaps while Fleener was out on just 36 percent. This decision may also have been related to the run-heavy play-calling, as Fleener has long been a poor blocker. Ryan Fitzpatrick played poorly in this game. He completed just 47.1 percent of his passes and was the first quarterback all season to not throw for multiple touchdowns against the Browns. It was a minor miracle that the team even managed to get 161 yards out of Brandon Marshall and Quincy Enunwa. Yet, that's the beauty of volume, as the duo handled 58.9 percent of the Jets' team targets. Derek Carr broke the Raiders franchise record for most single-game passing yards with 513 on Sunday. Oakland's passing game is built on short timing-based throws around the line of scrimmage. From our Next Gen Stats, Carr's 9.5 intended air yards on his passes was his second-highest mark of the season and his -2.8 differential between his intended and completed air yards was the second-largest gap of the season. Carr and the Raiders showed they have a tangible sky-high ceiling when forced to take to the air with aggression. He currently leads all Week 8 quarterbacks with eight attempts of 20-plus air yards. The Raiders receivers are becoming easier to project in terms of individual matchups. In a trend that's been developing all season, Amari Cooper nabbed 71 percent of his receiving yards when lined up at left wide receiver. Cooper has racked up 53 percent of his yards, and 50 percent of both his targets and receptions from that position this season. In a matchup with a team that has a weaker right cornerback, Cooper has a strong chance to go off. The Eagles continue to run one of the most short-area dominated passing games in the NFL. There was a stark difference in what the Eagles asked Carson Wentz to do, and how Dak Prescott was able to take deep shots on Sunday night. Wentz's 4.6 air yards per completion was the second-lowest figure among starting quarterbacks in Week 8. It's clear from Doug Pederson's comments on Monday morning that he doesn't see a reason to change that approach going forward. In fairness to the first-year head coach, the Eagles don't have the wide receivers to win on vertical routes right now. Jordan Matthews and Nelson Agholor are both underneath players, while Dorial Green-Beckham hasn't earned a full-time role yet and played just 65 percent of the snaps. The passing offense in Philadelphia doesn't offer much, other than Matthews as a high-floor play. This was an expected blip on the radar for Tyrell Williams, but he's still a massive buy for the stretch run. From Weeks 2 through 7, Williams led the team in targets, wide receiver catch rate, yards and red-zone targets. The whole Chargers offense are probably buys with the Bucs, Panthers, Raiders and Browns on the schedule in Weeks 13 through 16. The tight end situation might be the murkiest right now, however. Hunter Henry was a total stud when Antonio Gates missed multiple weeks earlier in the season, but his playing time was trending in the wrong direction even when he was playing over the veteran the last few games. Henry entered this game questionable with a concussion, but fell behind Gates in both the target and snap share. Gates played on 68 percent of the snaps, while Henry went out for 55 percent. The Jimmy Graham revenge game was sadly spoiled by a what was another lackluster day from Russell Wilson, who has not thrown a touchdown in his last three games. Wilson still doesn't look completely healthy and the improvisational portion of his game is still pretty clearly lacking. Wilson threw 14.7 percent of his passes from outside the pocket today, which is up from his rate going into this game (11 percent) but not quite to the level of his 2015 season (19 percent). Neither Wilson or any members of the offense can approach their theoretical ceilings on a week-in-week-out basis with this handicap placed on the unit. The Buccaneers played like a bad team, putting up less than 200 total yards after gaining a quick 10-point lead to start off the contest. The distribution looks like about what you would expect, with Mike Evans dominating the target share and everyone else merely chipping in. Russell Shepard snagged a touchdown for the second-straight week, but still played just 35 percent of the snaps. He needs more playing time, after Cecil Shorts caught zero of his four targets despite playing half of the offensive snaps. Cameron Brate also hauled in a red-zone score, but played a smaller percentage of the snaps (56 percent) than he did last week. Not a strong blocker on a run-first team, Brate looks like he will continue to spit snaps with superior in-line players Luke Stocker (55 percent) and Brandon Myers (22 percent). Kendall Wright had his second big day in three weeks, but still played just 39 percent of the snaps. Mike Mularkey said after the game that the team would leave Wright in a rotational role and not expand his playing time. Whatever his reason may be, we ought to believe he is telling the truth, as Wright has yet to crack 50 percent of the snaps in any game. That makes him incredibly likely to drop a 14-yard clunker in-between these productive games just like he did in Week 7. Jamison Crowder saw plenty of work despite Jordan Reed being back in the fold. He played on 72 percent of the snaps and tied for the team lead in targets. DeSean Jackson suffered at least one injury in this game and ended up only playing 36 percent of the snaps. Vernon Davis showed up with a 93-yard effort despite Reed's return from a concussion. Reed played 78 percent of the snaps while Davis played on 42 percent. Washington used their three wide receiver set on 70.4 percent of their plays, but mixed in multiple tight ends on another 28.4 percent. Perhaps this was just a one-week occurrence, but there's also a chance they mix in Davis more going forward. Not only is he playing extremely well, this may also help keep some mileage off of Reed.